As most of you who use Smartboards in the classroom know, Notebook 11 has come out. I absolutely love many of the new features and especially the tool bar. With Smart Notebook 11 though, came Smart Ink, which again I really like, but there are many out there who are annoyed by the Smart Ink bar that is on all of their open windows. For me it is not a bother, but that is my preference. If the Smart Ink bar is irritating then these steps will help you to disable the bar so that it no longer is automatically started when you boot your machine. 1. Click on the "Start" button and then click the "Run" option. 2. 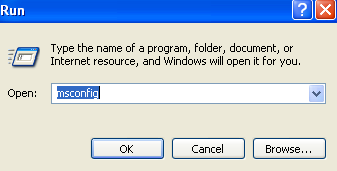 Type in "msconfig" into the space and click OK.
3. Choose the "Startup" tab at the top. WARNING: Know that changing settings in here are can cause programs to not start on start up, so make sure you don't just uncheck anything..
4. Scroll through the list and find the "Smart Ink" program. Just uncheck the check box. Then click the "OK" button at the bottom. 5. You will now be prompted to restart your machine so go ahead and click the "Restart" button. 6. After your computer boots back up and you have logged in, you might get a System Configuration Utility notice. Just click the checkbox (make sure it has a check in it) down at the bottom and click "OK". You are all set. You should now not see the Smart Ink toolbar on your open windows.